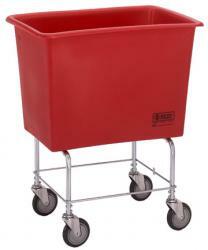 6 Bushel Elevated Poly Tub (32" x 21" x 36") Tubular zinc plated steel base and 5" polyurethane ball bearing casters. Helps eliminate stooping. Detachable base saves in shipping costs. Nominal wall thickness of .225" and improved double wall 1 3/4" thick Poly base. This product has never been more versatile meeting FDA requirements with applications in laundry, housekeeping, or tough material handling conditions. Available in white, dark blue or gray.